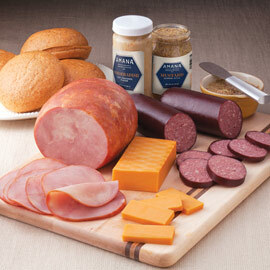 Whether entertaining or gift-giving, these popular Amana favorites will turn any occasion into a party! My parents sent my hubby and I an AMANA Party Favorites Box as an Easter surprise. Hubby saw AMANA on the side of the box and he knew a box of delicious treats had come our way. This gift box is full of a great sampling of products. The quality is always consistent, and delicious. The packaging is well done, neat and clean. This former Iowa girl is always happy to receive a box from home, especially when the box came from AMANA Meat Shop. This gift arrived on time and the recipients loved it. My sister sent me some of Amana products for Christmas, they were so flavorful that I ordered more for myself and for my brother. Had to call regarding the price of one thing I ordered and I actually got a person and a follow up email. Amazing.... Amana is certainly going to be on my list of things to order for myself and gifts from now on! We place quite a few orders with your company and we have enjoyed each and every one. We love the ride a longs that we can purchase along with our order. That is such a good deal. Love your products. The recipients were very pleased! Best Gift to Give or Receive!!! Excellent Quality!! Shared with family and friends throughout the holidays! 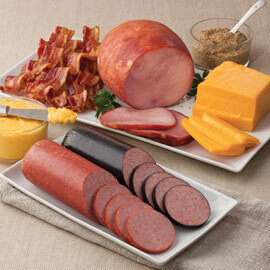 Your product is awesome as I have visited the Meat Shop many times. This was my first time in shipping to my family and friends. One of the shipments was delivered at the end of the third day on two day shipping. The individual I shipped to is elderly and only discovered the package on the morning of the 4th day. When he looked at his surveillance video he say that it was delivered at 7:47 pm after he had retired for the evening. The UPS driver never rang the bell to notify him that the package was delivered. He only checked because I had notified him that it had been delivered. When I notified UPS of this they said that I needed to notify you about the late delivery. The other two shipments were received without issue. Overall I am satisfied with the purchases as the recipients are satisfied with the products that they received. Amana Response: Hi Bob, Thank you for letting us know. We have seen that UPS delivers very late during their busy holiday season. They also hire a lot of replacement drivers who aren't as careful about ringing the doorbell or don't know the individual residents like a regular driver would. Sorry this happened to your one recipient, but hopefully he enjoyed his Amana goodies. We will report this to UPS. Thank you again! Good food, an excellent price, and delivered right on time. My dad really enjoyed this as a Christmas gift. Excellent taste and quality. I love shopping for family and friends. They were thrilled to get the treats. I love the Amana products. I only have one criticism. This was a gift so I wish the meats would have come in a nice, clean box. The box was VERY dirty and damaged. 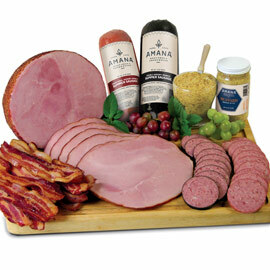 Maybe package the Amana Meat Shop box in another shipping box. Amana Response: We'll work on that! You may also comment that you need it double-boxed for a gift and we'll do that for you. Thanks for the suggestion, Ellen! 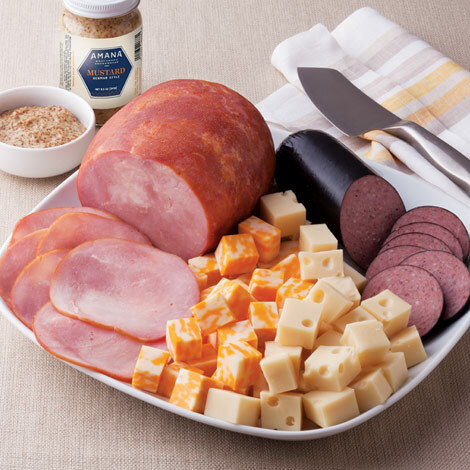 The product was delivered in a timely manner and the recipients were very pleased with the meat and cheese arrangement. Loved the flavors of the Summer Sausage and the cheeses wonderful. This is the best I have ever had. Thanks for making this. I placed all orders and everyone was very delighted.